At E3, EA Sports' top man—himself a mixed martial arts enthusiast who trains in the sport—was mum on the label's plans for how its surprise acquisition of the UFC license would fit into its publishing calendar—or which of its studios would even develop it. "The ink is still wet," on the deal, as Andrew Wilson (pictured at left) put it. Well, it didn't take long to dry. EA Sports today confirmed that its EA Canada studio in Burnaby, B.C., the home of Fight Night, will be developing EA Sports UFC. This appears to be a provisional title, but probably as good as any, though people may just call it UFC the way they do with the NHL and FIFA franchises, also made in British Columbia. The addition of the UFC license appears to have created a new division within EA Sports, the "Fighting Team," whose creative director is Brian Hayes, the gameplay design leader for Fight Night Round Three and Fight Night Champion. The general manager for the game oversees SSX and NHL as well. "Most of the team didn't even know about [the new UFC game] until the announcement at E3," Hayes said. 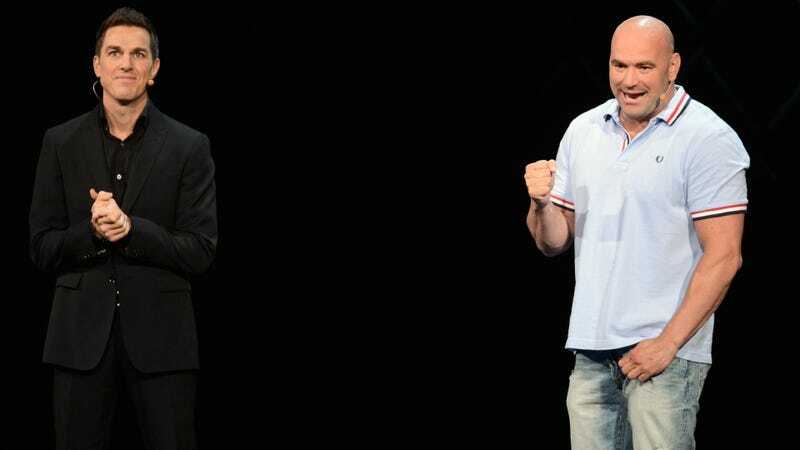 "We were all watching it together and when Andrew Wilson and [UFC president] Dana White (pictured at right) took the stage, everybody starting cheering. It was great." EA Sports MMA, the label's previous mixed martial arts title, was developed at the EA Tiburon studio in Florida; its team has been reassigned to other projects—creative director Jason Barnes, for example, has switched to NBA Live 13. No release date or platforms have been specified, but if Hayes was so closely associated with Fight Night it indicates that series may be on hold until the UFC-licensed MMA game arrives. Fight Night (and its predecessor, Knockout Kings) was originally an annual title, then went three years between 2006's Round 3 and 2009's Round 4. Fight Night Champion released to critical acclaim in 2011. At E3, when I suggested to Wilson that gamers would be looking for the next edition of the boxing series in 2013, he demurred on what the label's plans were for a sequel.